In developed countries, landuse is managed – has been usually for centuries – to yield productive agriculture from wilderness scrub. Managed features can be soft, benign and sustainable, but can they remain natural ? For the added benefit of, say, an Ecosystem Service, a natural feature will demand proactive design input. Even more so to achieve multiple benefits. Model & design to create wellbeing. Flood attenuation and biodiversity ‘corridors’ are two such benefits/services; when linked, they have particular potential. Reactive FRM ‘fire’-fighting by resilience. Above is illustrative of a tributary floodplain in an existing natural state . . . Here ‘marked-up’ with porous attenuation ecosystem features (aka dense wide hedgerows) . Addition of such ‘Eco/NFM’ could be expected to yield increased flood storage in the region of 20% with minimal lateral impact. 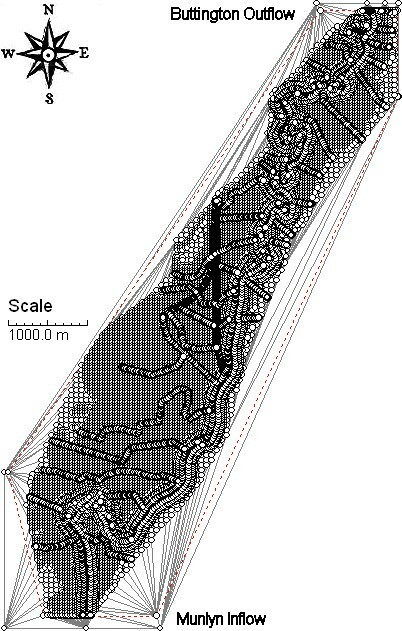 The graphic below shows the CFD mesh of a 2D variable friction model of the Upper Severn in Mid Wales – the ‘worms’ being dense wide high friction hedgerows. The images above are illustrative only and do not depict precisely a real location.